The 2018 Maruti Ertiga is expected to launch in India sometime during the month of August this year. It will get Suzuki’s new HEARTECT platform. The exterior design will be similar to the new Swift and Dzire. Cabin layout will take inspiration from the latter. The next-generation Maruti Suzuki Ertiga is all set to make its debut in India soon. The latest iteration of this MPV is going to have a complete overhaul in the majority of its parameters. It will share its underpinnings with the likes of the current breed of Maruti cars in India. Hence, it comes with Suzuki’s lightweight HEARTECT platform. According to recent media reports, it is likely that the 2018 Ertiga will make its first public appearance on 19th April, at the Indonesian Motor Show. The MPV will launch first in Indonesia. And subsequently, arrive in our country sometime during the month of August this year. Prices will fall in the range of INR 6.5 lakh to 9.5 lakh. 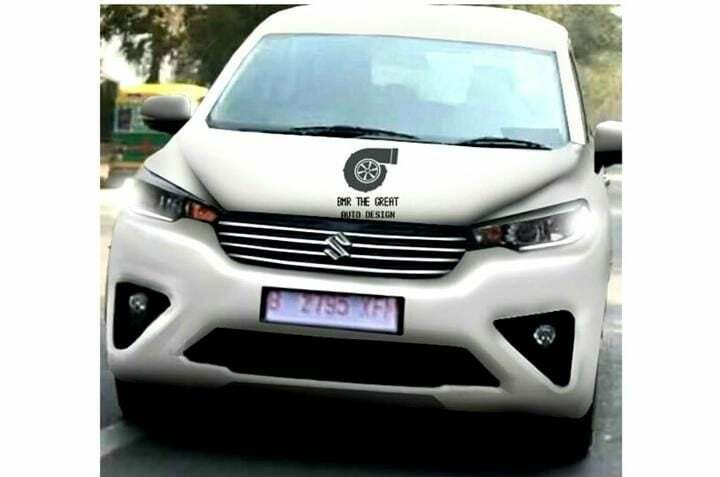 According to a report published in Automagznet.com, the cabin layout of the new Maruti Ertiga will take its inspiration from the one seen on the new Dzire. In its current iteration, the MPV still shares its interior design with the previous generation Dzire only. This means that the next-gen Ertiga is going to come with a flat-button steering wheel with wood inserts. The dashboard will have a dual-tone colour scheme of black and beige. The shape of the air-vents is going to be nice and angular. Since the two vehicles will share most of the components, consequently, the material quality is will also be on the good side. Furthermore, the top-sped trims are going to feature Suzuki’s Smartplay infotainment system. And the cabin will also get an automatic climate control unit which has a small display. The middle bench could come with a centre arm-rest. Just a reminder, the 2018 Swift also has a similar interior design layout. However, there are subtle differences like the controls and central vents for the air-con. Also, the new Swift comes with an all-black cabin colour scheme. Much like the interior design, the exteriors of the 2018 Maruti Ertiga will also take inspiration from its hatchback and sedan siblings. Just like the current generation Ertiga, the next-generation model’s front end will resemble with that of the Swift and Dzire. That said, there are going to be subtle differences for sure. However, in order to give the Ertiga its own identity, Suzuki could even design a completely unique exterior profile. We believe that the 2018 Ertiga is going to have the same engine specifications as before. The petrol derivative will get the 1.4-litre K-Series VVT engine. While the diesel derivative is going to get the 1.3-litre DDiS unit. However, certain media reports claim that with this generation update, the Ertiga might get Maruti’s in-house developed 1.5-litre diesel engine. Nevertheless, the MPV will get a 5-speed manual gearbox as standard across the range. Also, expect Maruti to introduce its AGS transmission for both petrol and diesel derivatives.